"In God we Trust ..."
“In God we trust, all others need documents!” is a notorious quote, attributed to a probably foul-tempered US FDA inspector. We do not expect the FDA to show up in the discovery units of our clients, demanding documents with nasty remarks, but we strongly advocate documentation of the results of any quality project. As a comprehensible summary of results. As a basis to assess and follow up on quality commitments. As a basis for quality communication and discussions with 3rd parties. As a tool for training and implementing quality concepts. One helpful format for result documentation is the “Quality Matrix”. Quality concepts like “maintenance” or “calibration” are plotted against phases of the discovery process (hit finding, hit optimisation etc.). The resulting boxes are ticked “Yes”, “No” or “Partly”. Each “Partly” receives a short explanation to avoid misinterpretation. 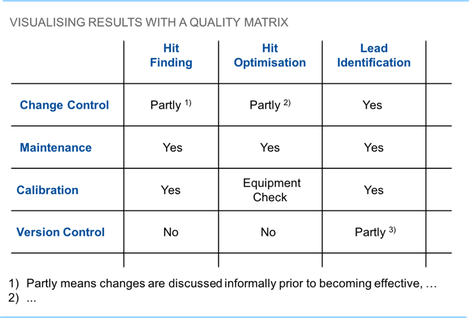 The Quality Matrix covers the complete results of a quality initiative in a tabular format. It is easy to generate, comfortable to apply in daily routines, delivers information at a single glance and can be easily modified or adapted.